This custom designed, inspirational religious tote bag will quickly become one of your favorite tote bags! 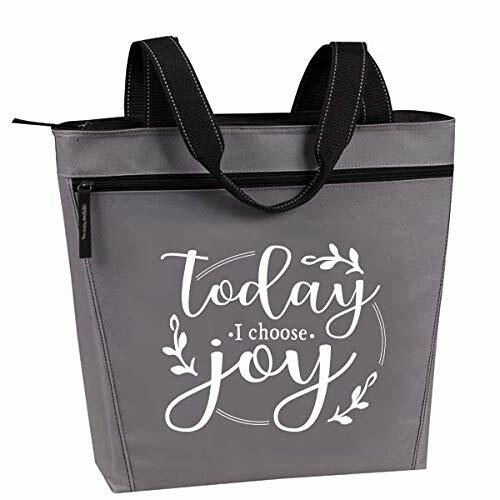 Has the inspiration saying, “Today I Choose Joy” screen printed on the front pocket, Includes 2 zippered pockets, a main compartment and large front pocket, that is large enough to hold a 10″ tablet with case. Heavy duty material that is made to last!PERFECT GIFT FOR ANY RELIGIOUS CHRISTIAN WOMEN: Show your favorite woman some love with this cute, fun, unique custom tote bag. Has the religious saying Today I Choose Joy screen printed on the front pocket of the bag. 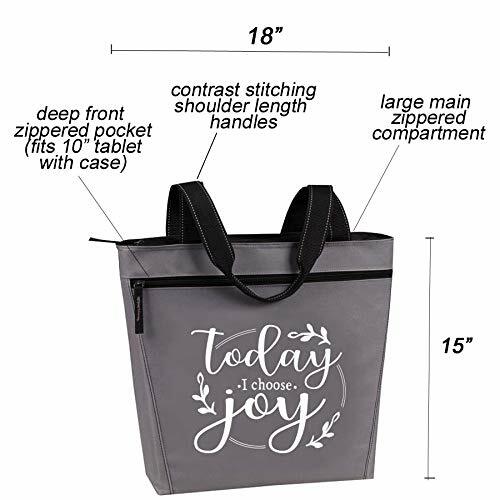 LARGE ZIPPERED CUSTOM TOTE BAG: Dimensions of this bag are 18″x15″x5″ – it has a zipper at the top and also a zippered pocket in the front. Has enough room for all of your belongings and more! HEAVY DUTY STURDY MATERIAL: Made with sturdy Polycanvas 600D, made to last and easy to spot clean! STRONG, STURDY HANDLES: Features long shoulder length reinforced web handles – strong and comfortable to tote around all of your favorite stuff to church or just around town!